Spin transport is an innovative fields in magnetism over the last decade due to groundbreaking discoveries: magnetic-quantum size effects, giant tunnel magnetoresistance (giant TMR) and the interaction of spin-currents within a magnetic nanometer sized pillar, the so called 'spin-transfer torque'. Our aim is to bring the understanding of femtosecond spectroscopy and transport through magnetic nanostructures together. Our expertise lies in ultrafast dynamics and building nanostructure devices. Spin dynamics of electrons: THz currents and all-optical writing. 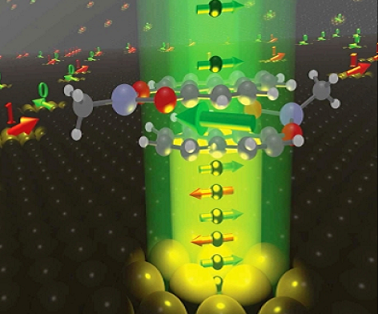 Dynamics on an ultrafast timescale determines the read write access time in future memory's. Our research explores the physics of ultrafast spin dynamics and spin manipulation with the help of femtosecond laser pump-probe experiments. The fundamental understanding of light-matter interaction on the femtosecond timescale allows an insight into the elementary spin relaxation in spin-electronic materials and optically induced magnetization. Their exploration is a key to THz spintronics and ultrafast switching all-optical switching and optical spin-wave excitation. Ultrafast spin dynamics projects are done in collaboration with Oksana Chubykalo-Fesenko (ICMM Madrid), Tobias Kampfrath (Fritz-Haber Institute Berlin) and Tiffany Santos (Western Digital), Ulrich Nowak (Konstanz), Peter Oppeneer (Uppsala) and Jeffrey McCord (Kiel). Driving currents by the ligth helicity dependent. The generation and detection of laser induced topological surface currents (spin-momentum locking) is the topic of a joint project. Spin polarized currents in topological insulators and their dynamics are investigated in the priority programme"Topological Insulators: Materials - Fundamental Properties - Devices“ (SPP 1666)" together withTobias Kampfrath (Fritz-Haber-Institute Berlin) and Christian Heiliger (Giessen University). An international collaboration supported by the DAAD-PPP project with the Czech Republic in a joint project FemtomagTopo with Eva Schmoranzerova (Laboratory of Opto-Spintronics, Charles University Prague) (ended 12/2016). Kerr microscopy image of skyrmions in a Ta/CoFeB/ MgO wedge, diameters are below 200nm. Skyrmions are magnetic whirls and solitons with interesting topological properties. Together with Jeffrey McCord (U Kiel) and Konrad Waldorf (Mathematics, U Greifswald) we explore the fundamental properties of formation, movement and interaction of the topological objects. Resreach is funden within the DFG priority program SPP 2137 "Skyrmionics: Topological Spin Phenomena in Real-Space for Applications". One main focus is the use of Ta/CoFeB/MgO skyrmion carrying layers, that we pepare for perpendicular magnetic tunnel junctions. 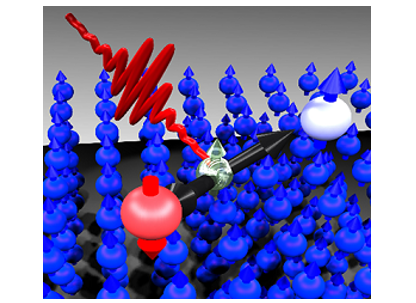 Ultrafast dynamics using femtosecond pump-probe methods and formation by quenching is focus of out collaboration with Claus Ropers (U Göttingen) and Sascha Schäfer (U Oldenburg). Here the focus is also on developing the use of new technologies, as the ultrafast transmission electron microscopy (UTEM) using ultrafast Lorentz microscopy. Spin wave in a notch pattern. We study surface and edge spin-wave currents and thermal confinements. Photo magnonics allows to excite spin waves using laser pulses. In periodic confinements Bloch states form and allow creating unique flexibility - designing spin wave metamaterials. We are interested in spin-waves at interfaces and surfaces of magnonic crystals. When do Bloch states form and what is the extension of an interface state in a nanostructured crystal? Can we observe topological effects? This is explored together with Jaroslaw Klos (Poznan University, Alfried Krupp WiKo Greifswald) on the theoretical side. Organic molecules with spin: PLY molecule, organic radical, forming an interfacial spin-filter with 20% tunnling magnetoresistance close to room temperature. Which elementary processes determine the output signal and functionality of a magnetic transport device? Magnetic tunnel junctions under investigation here are the building blocks for magnetic random access memory (MRAM) based processors, owning non volatile information at system restart, and via the spin-transfer torque effect can be rewritten. In combination with the ferromagnetic electrode, nanometer thick highly ordered oxide layers (MgO) serve as an efficient selective tunnel barrier (280% resistance change). Specially designed "soft semiconductors", novel organic materials open up new possibilities as "active" tunnel barriers. This is done in collaboration with Jagadeesh Moodera (MIT) and Swadhin Mandal (IISER Kolkata). Seebeck voltage generated by the spin-dependent currents in a magnetic tunnel junctions: adding up for parallel and antiparallel alignement to the total charge current switched by the junction. The investigation of spin polarized currents in magnetic nanostructures arising from thermal gradients is aim of the priority programme "Spin Caloric Transport" 1538 (project endend 9/2017). We study spin control of thermocurrents and voltages. Together with Andy Thomas (Bielefeld University) and Christian Heiliger (Giessen University) we investigate the effects of thermal currents in magnetic tunnel junctions within two projects from experimental and theoretical side. This joint research resulted in the finding of the magneto-Seebeck effect that allows controlling energy conversion via the magnetization in magnetic tunnel junctions. Current projects are focussing on ultrafast laser driven spin-currents in perpendicular tunnel junction with few monolayer MgO tunnel barriers and the mapping of detailed thermovoltage landscapes. 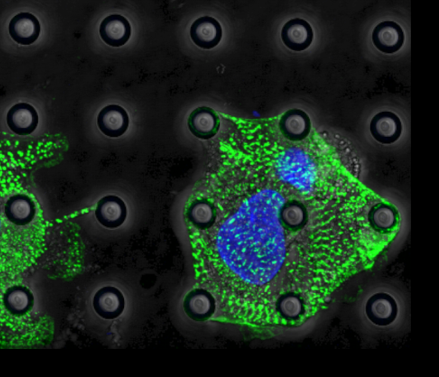 Lithographic structures for cell applications. Nanonewton forces and cell-nanostructure interaction of the cytosceleton. We are member of the interdisziplinary center for Innovation Competence - Humoral Immune Reactions in Cardiovascular Diseases (ZIK-HIKE) funded by the BMBF in the second round. We develope nanostructures for cell-related applications that allow to define specific artifical boundaries for bio-nanomechnical systems. This research is carried out together with Mihaela Delcea. T. Seifert, S. Jaiswal, U. Martens, J. Hannegan, L. Braun, P. Maldonado, F. Freimuth,A. Kronenberg, J. Henrizi, I. Radu, E. Beaurepaire, Y. Mokrousov, P.M. Oppeneer, M. Jourdan, G. Jakob, D. Turchinovich, L.M. Hayden, M. Wolf, M. Münzenberg, M. Kläui, Nature Photonics 10, 483–488 (2016). T. Kampfrath, M. Battiato, P. Maldonado, G. Eilers, J. Nötzold, S. Mährlein, V. Zbarskyy, F. Freimuth, Y. Mokrousov, S. Blügel, M. Wolf, I. Radu, P. M. Oppeneer, M. Münzenberg, Nature Nanotechnology 8, 256 (2013). M. Walter, J. Walowski, V. Zbarsky, M. Münzenberg, M. Schäfers, D. Ebke, G. Reiss, A. Thomas, P. Peretzki, M. Seibt, J.S. Moodera, M. Czerner, M. Bachmann, C. Heiliger, Nature Materials 10, 742 (2011). B. Lenk, H. Ulrichs, F. Garbs, M. Münzenberg, Physics Reports 507, 107 (2011). G. Müller, J. Walowski, M. Djordjevic, G.-X. Miao, A. Gupta, A. V. Ramos, K. Gehrke, V. Moshnyaga, K. Samwer, J. Schmalhorst, A. Thomas, A. Hütten, G. Reiss, J. S. Moodera, M. Münzenberg, Nature Materials 8, 56 (2009). J. Walowski, G. Müller, M. Djordjevic, M. Münzenberg, M. Kläui, C. A. F. Vaz and J. A. C. Bland, Phys. Rev. Lett. 100, 246803 (2008). M. Djordjevic, M. Münzenberg, Phys. Rev. B 75, 012404 (2007). Workshop on charge and heat dynamics in nano-systems, Laboratoire Physique des Solides, Orsay, France, 10.-12.10.2011. 2nd Workshop on Magnonics, Recife, Brazil, 7.-10.8.2011.
International Workshop on Spin Dynamics in Nanomagnets, Dissipative versus Non-Dissipative Processes, Universität Duisburg-Essen, 18.10.-20.10.2010.